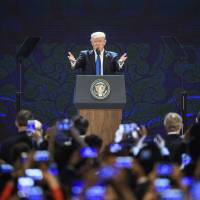 Trump’s remarks reflected an awareness of the challenge posed by China. 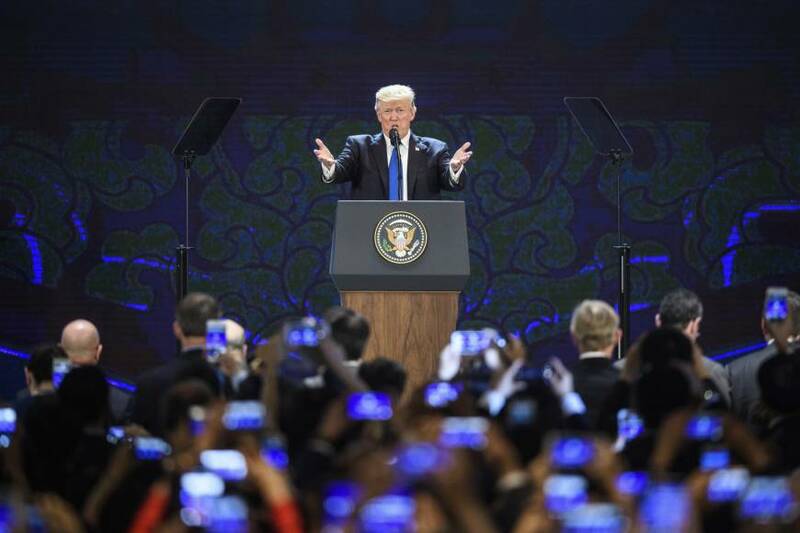 In the National Security Strategy (NSS) issued by the U.S. government shortly after Trump’s visit to Danang, China (and Russia) were both identified as “revisionist powers” posing the “central challenge” to American prosperity and security because of their attempts to upend the global and regional orders constructed by the United States in the postwar period. The FOIP is underpinned by this new perception of China. Even given the polarization of American politics in the Trump era, this assessment of China is now becoming a rare point of bipartisan consensus. What is the strategic significance of this new approach? To begin with, it firmly binds the U.S. to the rest of Asia. If the U.S. loses its economic base and presence in Asia, its military and diplomatic involvement with the region will inevitably weaken. The Indo-Pacific strategy works to once again promote American involvement with Asia. Second, the approach may restrain China’s “G-2” offensive consistently pursued throughout the Obama administration. It represents China’s goal of creating a “new relationship between the great powers.” China’s real aim in pursuing a special “G-2” relationship with the U.S. is to drive a wedge between the U.S. and Japan, thereby weakening the Japan-U.S. security alliance. Furthermore, the strategy contributes to making the Quadrilateral Security Dialogue among Japan, the U.S., India and Australia a sustainable framework of cooperation. The approach can also be expected to prevent the Quad from developing into an outright attempt to contain China militarily, instead turning it into a layered strategy of balancing against China through diplomatic and economic efforts, development aid and soft power. To be sure, there are also many questions with the FOIP strategy. First, there is the question of geography (and geopolitics). Does the “Indo” in “Indo-Pacific” refer to the country of India or to the Indian Ocean? Is Africa included within the scope of the FOIP? Second, ASEAN countries are unhappy that “Asia” is missing from “Indo-Pacific” — a fact that seemingly ignores the central role that ASEAN states have played in building a regional cooperation process in East Asia and risks turning FOIP into a divisive force within the ASEAN group. During my recent visit to Jakarta, however, I was told that Indonesia expects Japan to fulfill the role of promoting the FOIP concept. The Indonesian government is at work on a national vision to mark the centennial of Indonesian statehood in 2045. One centennial goal now under discussion is becoming one of the major powers comprising the world’s G-5 by 2045. This reformulated G-5 would include Indonesia and Japan in addition to the G-3 of the U.S., China and India. Indonesia is also taking steps to strengthen its relationship with India. However, the problem lies with India. Whether the Indo-Pacific will take root as a strategy depends on to what extent India is interested in the peace and stability of East Asia and the Pacific Ocean, and in what way India will participate in such efforts. India will certainly be a partner of cooperation with regard to security of the sea lanes that link the Indian and Pacific Oceans, and the maritime security of the surrounding areas. When it comes to economy and trade, however, India has yet to become a “free and open” partner. Although it is a member of the Regional Comprehensive Economic Partnership, India has maintained a cautious stance toward multilateral trade liberalization and opening up of markets under the RCEP. Together with the rule of law, the principle of multilateralism is one of the most important tenets of the liberal international order. Since the end of the Cold War, Japan has pursued the “fusion” of the Pacific and Asian regions in a bid to keep the U.S. involved in the region. Similarly, the key to the success of the Indo-Pacific strategy may be the extent to which Japan can assist in the “fusion” of Asia and the Indian Ocean. The Trump administration must realize the folly of its unilateral “America First” trade policy as soon as possible. After all, a “free and open” trade system is absolutely essential to the creation of a “free and open” regional order. Yoichi Funabashi is chairman of the Asia Pacific Initiative and was editor-in-chief of the Asahi Shimbun. This is a translation of his column in the monthly Bungei Shunju.